Part of having kids is dealing with clutter. Part of working in a creative field is often appreciating clutter. Being surrounded by loved things as you work and live has always brought joy to me. I don't like a mess--rather the contrary--but I've always been just fine with clutter. What's the difference? 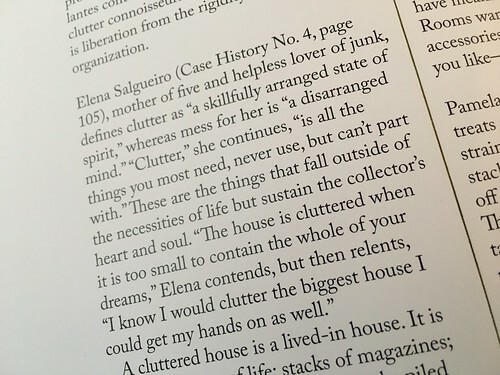 Never quite knowing why, I read this: "clutter is all the things you most need, never use, but can't part with." It makes sense. 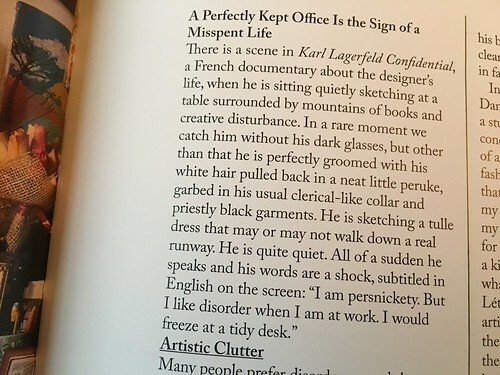 And it's nice that Karl Lagerfeld prefers disorder as he works. It's all in this cool coffee table type book by Mary Randolph Carter, the Creative Director @ Ralph Lauren. 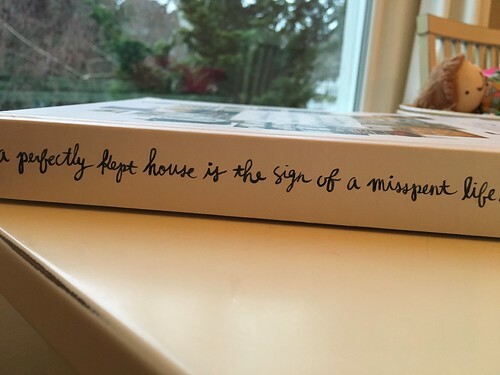 After finishing The Goldfinch last week, that line stood out most. How a painting, or any art, travels through time and touches different people, differently. Yours, yours. I was painted for you, another line goes toward the end. But indeed, when something grabs you, and you have a little bit of a welcomed reaction inside of yourself, it's good to stop and give it your full attention. 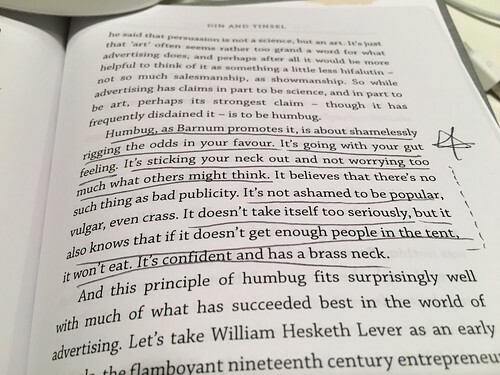 I re-read The Medium Is The Message often. Because of the way it can make you think, and question. So it was cool to see it summarized in a short video. I wonder how Mr McLuhan would feel about his stuff in a video on a blog. Guess I should read it again. Another nice find through Fraggl. Ian Luna: Much ink has been spilled in analyzing your approach, especially in comparison to the work of DJ Premier, Dr. Dre, J Dilla, Madlib, 9th Wonder, Just Blaze and RZA... Whose work did you find was the most compelling or challenging? 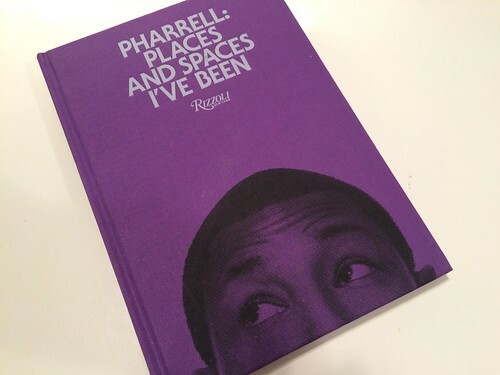 Pharrell Williams: Oh, all of the above. IL: All of the above? IL: I want to commend you. That description of hip-hop music production is probably the most generous anybody's ever put it. In the presentation "Are Brands Fracking the Social Web?" there's talk about shifting brand tones. Moving them beyond just feelings and compressed language to become a tone of action. I've long held that "tone" is one of the most important parts of a creative brief. But it's often dismissed because tone, too often, shows up as a series of common, lazy, uninspiring words. 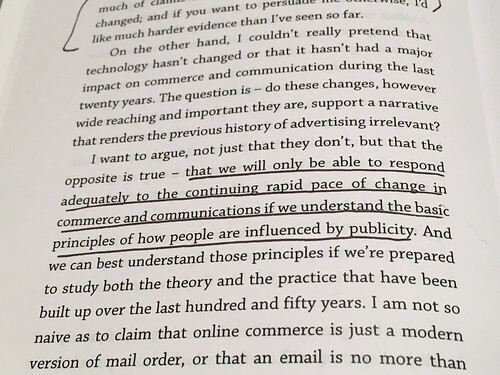 In the book Contagious: Why Things Catch On Jonah Berger writes that when it comes to understanding word of mouth, only 7 percent happens online. You might think it would be higher. I did. But it's only 7 percent. Which makes sense. Life is lived going out to lunch and chatting in the hallways. We're talking offline, face-to-face, much more than we're talking online. These things relate. A tone of action is more remarkable than a tone of voice. What an organization did, how they handled a situation, their degree of uniqueness and originality... such things of action warrant more word of mouth storytelling than just their voice. In many things, the more resources we add, the better the output. This, of course, can be graphed with increasing performance tying to increasing resources. But does an ascending performance line start to dip back down once too many resources are added? Malcolm Gladwell provides some research in David and Goliath that argues this happens more frequently than we may think. "Inverted-U curves have three parts, and each part follows a different logic. There's the left side, where doing more or having more makes things better. There's the flat middle, where doing more doesn't make much of a difference. And there's the right side, where doing more or having more makes things worse." It's a provocative thought. In business, be alert to the Inverted-U Curve. If there's too much ideation time, when do we begin to over-think? If there's too much collaboration, when do we begin to dilute? If there's too much data when do we begin to over-react? Nice to know there's a principle for such questions. So for my birthday this year I received my first Kindle from my wife. I love it. Indeed, it's just like this. Philip Tetlock is a professor of psychology and political science who set up a 20-year experiment that involved 300 experts in politics. He asked them to predict the future. And they didn't do very well. Those who assigned probabilities to rosey scenarios found out that those came true only 15% of the time. But the ones who assigned doomsday scenarios were only right 12% of the time. For some reason I find some delight in learning that the doomsday-ers did worse, if only by a few points. It's comforting to know that, odds say, the negative and the dramatic are often incorrect. So it's probably good to use such doomsday speak as only a general guide for re-evaluation and prompting of further thinking. In any event, the book Future Babble looks good.